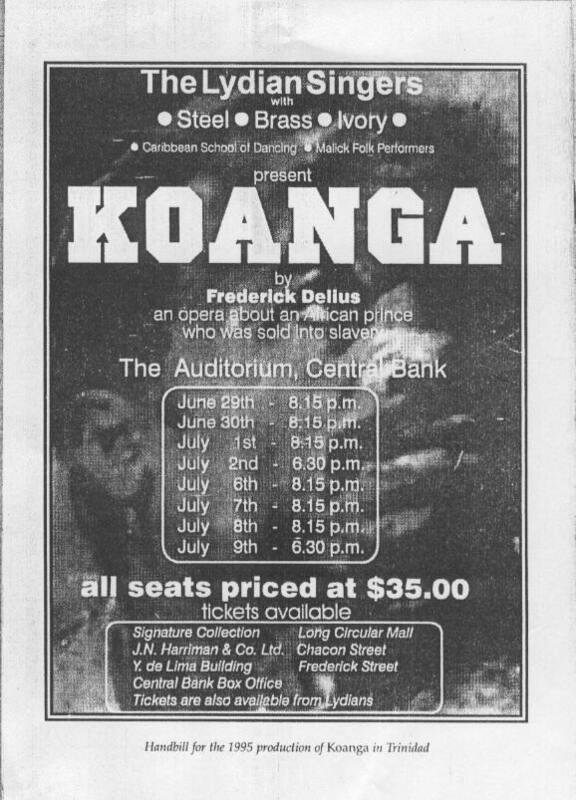 "In June and July of 1995, there were 10 performances of Delius' KOANGA in Port-of-Spain, Trinidad with an all-black cast and chorus of 120 accompanied by four synthesizers and a steel drum band. Thanks to U.K. Delians Derek Cox and Sian Carlin, we shall soon have a video of this amazing production. Sian lives in Cardiff, Wales, but was a voice coach and on of the synthesizer players." In 1935, Sir Thomas Beecham's production of Koanga had ten performances at Covent Garden and around the provinces. Sixty years later, in 1995, there were ten more in the Central Bank Auditorium in Port of Spain, Trinidad, eight advertised and two more by popular demand. Delius and Beecham would have been surprised, perhaps delighted, by this adventurous amateur effort by the Lydian Singers, a 120-strong choir, under their dedicated Director Dr. Pat Bishop. They would have been amazed at the unusual orchestration - steel band, brass and synthesisers, with dancers from the Caribbean School of Dance, and at the power and sincerity of the young lead singers. 'The choir's performance was a joy to behold... Well-executed harmonies and inviting stage presence went a long way in sustaining the excitement. The solo performances of the principal characters were, for the most part, commendable. There were those moments when the voices got lost within the music, or when the clarity slipped. This did not diminish the overall lustre of the production. 'The Lydians used a mixture of acoustic and electronic pianos, synthesisers and organs to create a full sound. The horns added the dramatic phrasing needed. There were a couple of incidents of missed cues and off notes that may be dismissed as opening night jitters. To help her with the soloists, Dr. Bishop roped in her old friend, Sian Carlin, from Cardiff, officially as voice coach, but also as 'guide, philosopher, inspiration and consolation'. Sian spent many weeks of 1995 in Port of Spain, but just found time to fly back to England to join the Society and see the Chelsea Opera Group's performance of Koanga in the Queen Elizabeth Hall in May. THE LYDIANS ....proceeded to dismantle the concept that such music must be performed by conventional orchestra, an example previously set by their production of Delius' KOANGA. The Lydian Steel Ensemble, under the direction of Ben Jackson, along with regular members of the Lydian Orchestra, combined to interpret the work and executed it with enough elegance to inspire ballerinas from the Caribbean School of Dancing, who open each act. The Lydians are staging Turandot, their most ambitious production to date, in celebration of their 20th anniversary this year. Musical director Pat Bishop said the choir would be doing a great disservice to "our country, our music and ourselves" if the national instrument were to be excluded from the production. Bishop's long-standing relationship with the steelband movement has been well documented and the Lydians have had close relationships with the Witco Desperadoes, the Samaroo Jets and several other steelbands. The choir now has its own steelpan orchestra, the Lydian Steel, which made history in 1995 as the first steelband to accompany an entire opera - Delius's KOANGA. Religious and "prestige" schools have passed down musical training introduced by nuns and priests and expatriate teachers. In the Hispanic islands there are some good symphony orchestras - Puerto Rico holds an annual Pablo Casals festival in honour of the great Spanish cellist who spent his twilight years there. Jamaica has a music school; in Trinidad, enterprising opera productions have ranged from Mozart's The Magic Flute to Scott Joplin's Treemonisha and Delius's Koanga, and the Lydian Singers are producing Puccini's Turandot this year.